The IIAR is delighted to host a teleconference led by OVUM/Datamonitor on Tuesday 29th June 2010 from 16:00 BST to 17:00 BST / 11:00 EST/8:00 PDT. Eamonn Kennedy, Research and Analysis Director at Datamonitor, will be with us to introduce the Black Book of Outsourcing. The Black Book of Outsourcing: what AR professionals need to know about the world’s largest investigation into customer satisfaction with outsourcing. Many AR professionals have heard of The Black Book of Outsourcing. Some understand the details behind it but few understand the changes that Datamonitor has made to this business in 2010. The Black Book of Outsourcing does not rely on traditional AR channels – it goes direct to clients for their feedback on satisfaction with outsourced services and the providers who deliver these services. In 60 minutes, this session seeks to provide AR professionals with answers to their executives’ questions about The Black Book. Eamonn will focus on the information requirements of AR professionals and will be happy to take questions. IIAR members who would like to join the call should RSVP on huddle or by email to Jane.Courtenay (at) analystrelations (dot) org. 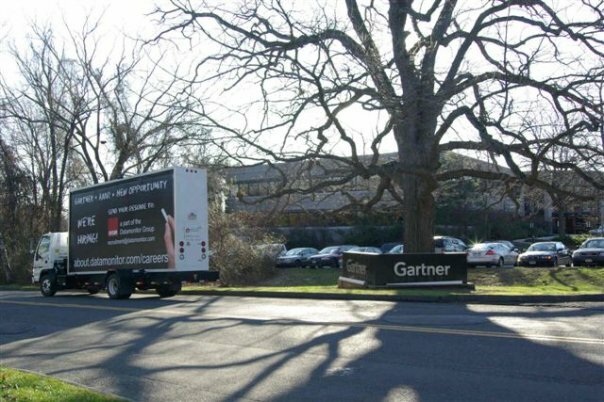 Datamonitor’s truck rolled around the Gartner headquarters in Stamford, CT, this morning. The firm’s Ovum’s business is aiming to hire, and the hoarding on the van asked analysts to send their resume in. As Greg has argued, Datamonitor may have to work hard to get Gartner analysts’ attention: and it seems to know it. Well, almost…. Ovum kindly gave us an exclusive for the video below. Following Datamonitor’s re-launch of their consolidated IT research brands under the Ovum name, they have held two back to back events in London and New York: Collaborative Intelligence launch event. The London event featured “the Patriarch” Gideon Gartner (the founder of Gartner and Giga), superstar Jonathan Yarmis (LinkedIn, ex. AMR and now with Ovum, @jyarmis) and IIAR co-founder and AR extraordinaire David Rossiter (blog, @davidrossiter, LinkedIn, firm). The New Amsterdam event was with Carter Lusher instead of David. What’s the future of IT analyst firms? Is the average age and experience of analysts decreasing? Should IT analysts be paid like financial analysts, on results? What should be the alternatives to Gartner? And finally, do check Ovum’s landing page on AMR: Does the Gartnerization of AMR raise concerns about the future quality of their research? Since the last post I wrote on Datamonitor/Ovum/Butler after Mark Meek and David Mitchell came to present at the IIAR London Forum, they have been busy streamlining the organisation and bring together their research products. – As promised, the IT brands have all been consolidated under Ovum. Datamonitor provides the line-of business/non-IT research and Orbys provides sourcing research. Butler events are to be co-branded, as Ovum Butler. Ovum’s running a webinar tomorrow; I’ve pasted the invite below with their permission. As of today Ovum has integrated it’s IT offering with Datamonitor Technology and Butler Group creating a single, more powerful research partner under the Ovum brand. In addition Ovum’s 150+ ICT analysts will be working side-by-side with the Datamonitor Group’s 350+ business analysts – an approach which we call Collaborative Intelligence. This Collaborative Intelligence approach will produce research and analysis that tackles the problem of the business value of IT. Dial in and find out why SageCircle – Analysts of Analysts – say “The reorganization shows real promise to shake up the analyst market”. Join David Mitchell, Ian Charlesworth and Tim Jennings, Directors of technology research who will introduce the new research agenda, Collaborative Intelligence philosophy and how it will benefit your company. Duncan Chapple from Lighthouse AR has posted on his blog the following entry: Datamonitor, Ovum & Butler cohabitation makes AR easier (Analyst Equity). It’s a good summary of the last IIAR London Forum, kindly hosted by David Rossiter from Sunesis and at which Mark Meek / Datamonitor CEO and David Mitchell / SVP IT Research. Overall, I would say the reactions were very postive, juste tempered by a “wait and see” attitude towards whether they will execute efficiently. This is my personal take on some of the reactions and by no means an IIAR position or the aggregation of all the present members opinions. We can’t say too much as we’re bound by an NDA, but here are my thoughts -for what they’re worth. We have the pleasure today of welcoming David Mitchell, Senior Vice President, IT Research, Ovum and Research Fellow, Datamonitor Group. David has his own blog on IT issues in Asian and other emerging economies: Geosophical Technologies. What are your coverage areas? Very wide. I’ve published about a range of things. In terms of industry verticals I’ve written about telecoms, government, financial services, professional services, retail and construction. In terms of technologies and services I’ve written about BPO, databases, application development, high performance computing, grid computing, software-as-a-service, cloud computing, HCM applications, ERP applications, collaboration technology, Web 2.0, operating systems, IT-Telecoms convergence, eLearining, incentive compensation, the productization of services, and globalization…. to name but a few. There are two areas where I work on consulting projects for customers most often: enterprise applications and commercial deal negotiation. What are your opinions of the IT Analysis Marketplace and where do you see it going? or specialization are the most important criteria going forwards. Specialization can be by geography, technology or business theme but it needs to be resonate with a focused buying audience. Small and generalist is not a good place to be. Typical day… no such thing, as I travel so much and spend as much time away from the office as I spend in it. When I’m in the office the day day normally starts about 6.30 a.m. with catch-up calls with Asia Pacific staff and clients. Middle part of the day is focused on meetings with UK clients and staff, and research briefings -both formal and informal. The day tails off about 7 p.m. with US calls with clients and staff, before getting home about 8.30 p.m. I rarely do less than a 60 hour week. Now, c’mon, tell me an AR horror story? Not a horror story but a dislike. I will do everything possible to avoid events held in Las Vegas. It’s a city that I dislike a great deal and that I can see no redeeming qualities in. Ovum’s revenue is primarily focused on our syndicated client base, with the majority of our revenue coming from this source. Consulting and ad hoc revenue comes from the analyst teams and our consulting teams, including the Orbys sourcing advisory business that Ovum acquired post-IPO. Revenue is well balanced between vendors and enterprise buyers, something that we believe is important for the integrity of the advice that we provide but also gives greater revenue predictability than a reliance on either community would. We also have a good geographic revenue balance across EMEA, US and APAC markets. Any favourite AR professional you’d like to mention? Any why? Too many to single out any individual. Among the talented people that I’ve worked with are Peggy O’Neil, Carter Lusher, Evan Quinn, Naomi Higgins, Paula Schmidt… They’ve all got one thing in common… they invest time in building relationships between the vendor and the analyst. What are your offerings and key deliverables? detailed UK market coverage continues to be popular, as does our government research. Any hobbies or favourite restaurant / food that you’d like to share? I’ve recently invested in an aquarium and have started to keep marine fish. It takes a lot of time and patience but it’s also quite relaxing. Genealogy is another one of my hobbies; delving back into the history of our family. Favourite restaurants… Le Manoir aux Quat’Saisons in Great Milton, The Peat Inn near St. Andrews, Bobo’s in San Francisco, Doyles at the Quay in Sydney, Hutong in Hong Kong, Monte’s Trattoria on MacDougal in New York, Vivat Bacchus near our London office, and Locanda Locatelli in the West End of London. What is your biggest challenges for the upcoming 6 months? And for the next 30 mn? the next 6 months. On top of client engagements are a range of research projects that involve clients from around the world. The second biggest challenge is to continue to expand the Ovum IT research team, something that we’ve spent a lot of the past 6 months investing in. Is there another analyst (a peer in your firm or with another firm) whose work you rate highly?